Make professional high end lay flat mounted photo albums for weddings and other events. With our thin 200mc and thick 850mc mounting boards, you can make elegant lay flat mounted albums in-house of any size with any paper you want to print on! No gap continuous spread print is vastly superior to mounted albums that have a gap between the left and right pages! Lay Flat Panoramic Mounted album binder from 2" x 2" to 18" x 16"! 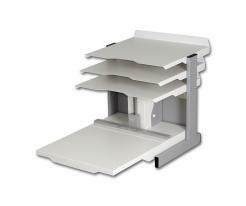 Lay Flat Panoramic Mounted album binder from 2" x 2" to 18" x 18", Electric semi automated operation with supplies stand! When matched with the Fastbind Casematic Series case maker, you can produce high end custom made lay flat mounted photo albums from 1 to 1000 on demand!